The spanner crab is red/orange in colour with some small white spots on the top of the carapace. Their claws are large and inward facing. Unlike other crabs, which move in a sideways motion, spanner crabs move forwards and backwards. A maximum weight of 900 g and a carapace length of 150 mm. Spanner Crabs inhabit coastal waters along the east coast of Australia, from Yeppoon in Queensland to Nowra on the south coast of NSW. There is also a population to the north of Perth in Western Australia. 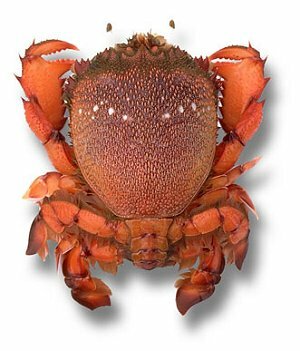 Spanner crabs prefer sandy habitat to depths of more than 100 m, but may be found in a number of environments, from sheltered bays to surf zones.